Support visual function and ocular antioxidant status. Lutein and Zeaxanthin are critical antioxidant carotenoids for the macula of the eyes. Dark green, leafy vegetables are good source of lutein and zeaxanthin. Lutein and zeaxanthin reduce age-related increased in the lens' density. Billberry Extract (Vaccinium myrtillus) contains anthocyanosides, which are plant pigments known to protect night vision. Grape Seed Extract (Vitis vinifera) supports the strength of capillaries and other blood vessels in the eyes. Alpha Lipoic Acid, Selenium and Vitamin B2 support the antioxidants glutathione and glutathione peroxidase, which protect the eyes' lenses. Ginkgo Biloba Extract promotes circulation and contains potent free radical scavenging flavonoids known as ginkgoflavonglycosides. Quercetin protects lens architecture by its effects on the enzyme aldose reductase. Take 3 capsules per day with food, or consult your qualified health consultant. 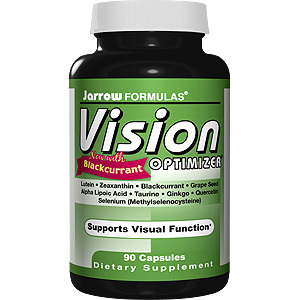 Vision Optimizer™ supports visual function and ocular antioxidant status. NOTE: Individuals who are diabetic, taking blood thinning medication, being treated for glucose control, pregnant or lactating should consult a health care professional before using this product. Lutein and Zeaxanthin are critical antioxidant carotenoids for the macula of the eyes. Dark green, leafy vegetables are good sources of lutein and zeaxanthin. Lutein and zeaxanthin reduce age-related increase in the lens’ density. Bilberry Extract (Vaccinium myrtillus) contains anthocyanosides which are plant pigments known to protect night vision. Alpha Lipoic Acid, Selenium and Vitamin B2 support the antioxidants glutathione and glutathione peroxidase, which protect the eyes’ lenses. Vision Optimizer - is shipped in a discrete, unmarked package. Orders are processed immediately and usually take about 3 to 5 working days to be received. We do ask that you try it for 2 to 3 weeks to feel the full effects. Any information received is used only for order processing and shipping purposes. Your information, such as e-mail address, will never be disclosed to a third party.